robisher's voyages and the lands he encountered had little influence on the mapmaking world. Due to the blanket of secrecy the Privy Council tried to impose, demanding that all records of the voyages be handed over to them, there have been passed down to us only three maps or charts produced either for use on, or as a result of, the expeditions. The censorship also helps explain why the regions Frobisher explored appeared on only four maps during the remainder of the sixteenth century. In 1576, William Borough prepared a navigational chart of the North Atlantic. It was to be used for plotting Frobisher's initial voyage; in fact, it was also used on the subsequent voyages. It included an outline of the major known coasts, in colour, as well as several place names. 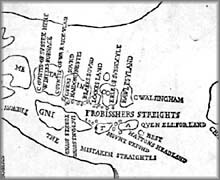 the Northwest Passage, to which Frobisher believed he had found the entrance, was now called "Frobusshers Straightes". Frobisher's Strait runs westward between several unnamed islands and leads into a principal northwest passage. These elements were included on a few subsequent maps: one produced by John Dee and given to Queen Elizabeth in 1580; a second by Dee in 1582; a third map produced by Michael Lok; and the Stockholm Chart of the North Atlantic, of uncertain origin. The second map showing the discoveries of the expeditions focuses on the region surrounding Meta Incognita and the Northwest Passage. John Dee's 1580 map was modelled after the one by Mercator in 1569, but with the addition of details perhaps from Spanish or Portuguese sources, and the inclusion of Meta Incognita. Inexplicably, Dee presented two different locations for Meta Incognita. 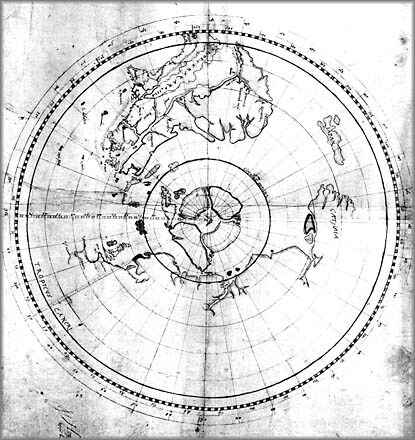 The northern one was based on data from Frobisher's explorations, while the southern version was taken from Mercator's map. 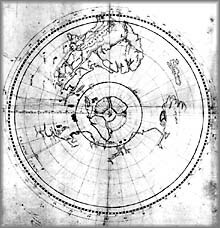 In 1582, Dee produced a polar chart which he dedicated to Sir Humphrey Gilbert. It shows the northern lands of America, Eurasia and the polar islands with the waterways which could link them for trade. It too has both placements, southern and northern, of Meta Incognita. 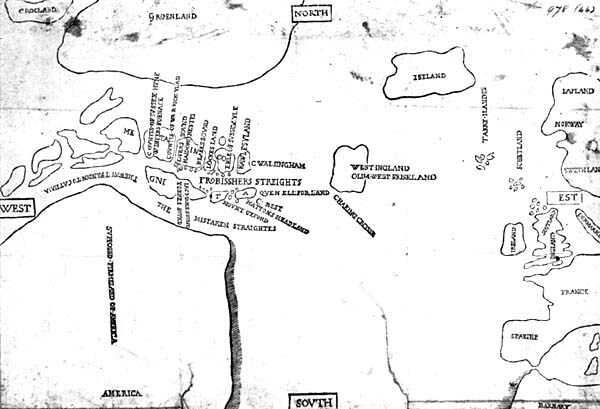 The 1582 map also shows two inland water routes to the South Seas, via the St. Lawrence River. 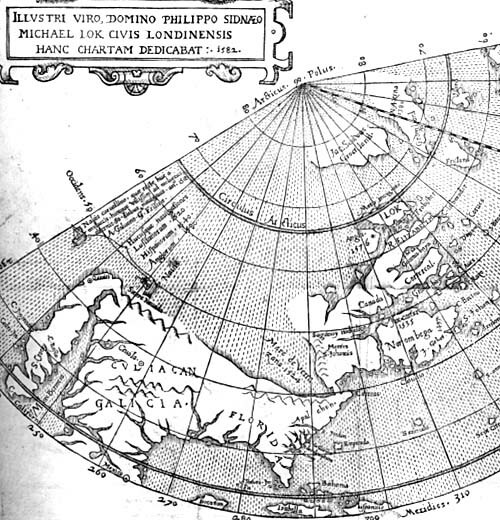 Michael Lok also produced a polar map in 1582 (based partly on Verrazzano's of 1529), published by Richard Hakluyt; it showed the location of Meta Incognita, although the central focus was northeastern North America. This map was designed to attract investors in Gilbert's plan to colonize that part of the world, and to encourage further search for a passage to the Pacific. 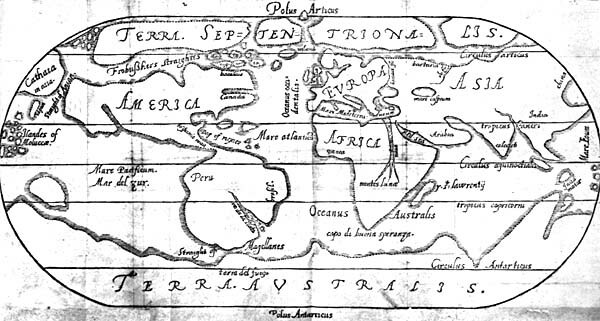 It is a simplified view of North America; omission of the northwest part of the continent was intended to imply ease of access to the South Seas. Lok's map provided a simplified version of the Meta Incognita region, based on the 1578 Beare-Best map. In his version, however, Lok increased the size of the island named after him and reduced the significance of Meta Incognita. The Stockholm Chart is believed to have been produced by Englishman James Hall sometime between 1587 and 1605. He was leader of an expedition organized to rediscover Greenland for the Danish king. It accurately located Meta Incognita in relationship to the surrounding lands. After these maps were produced, a major mapping failure occurred, due to the suppression of accurate information about the location of Meta Incognita. Frobisher's Strait and places associated with it were moved southeast from Baffin Island to the south end of Greenland. This displacement was not corrected for two centuries.